A resident at luxury condominium The Sail @ Marina Bay has complained on social media that all four elevators at Tower 2 of the posh apartment complex broke down this morning, forcing her to climb down 61 floors. The Sail @ Marina Bay was developed by local developer City Developments Limited (CDL) and AIG Global Real Estate. The Executive Chairman of CDL is Singaporean billionaire Kwek Leng Beng. 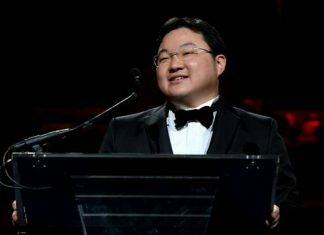 Kwek is the son of the founder of the renowned conglomerate Hong Leong Group. Besides sitting on the board of directors of CDL, which is a subsidiary of Hong Leong Investment Holdings Pte. 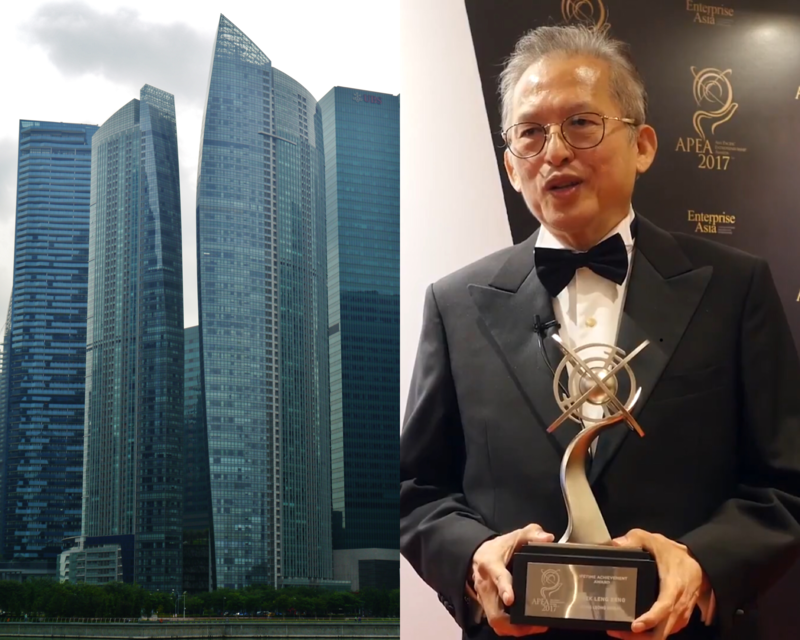 Ltd where Kwek also serves as Executive Chairman, Kwek is the Chairman and Managing Director of Hong Leong Finance Limited (HLF) and non-executive Chairman of Millennium & Copthorne Hotels plc (M&C). 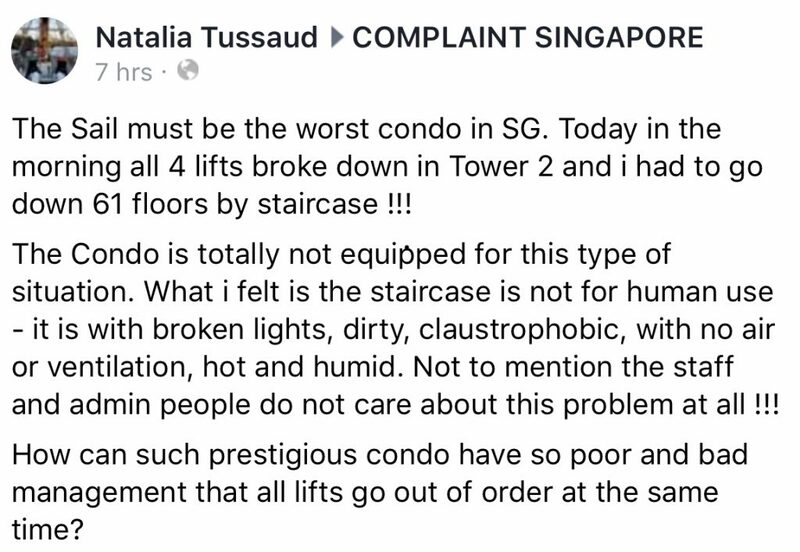 Taking to social media to express her frustrations with the management of The Sail @ Marina Bay this morning, resident Natalia Tussaud wrote on Facebook group ‘COMPLAINT SINGAPORE’ that she was forced to use a dingy staircase to go down over 60 floors that she says does not seem fit for human use. “The Sail must be the worst condo in SG. Today in the morning all 4 lifts broke down in Tower 2 and i had to go down 61 floors by staircase !!! “The Condo is totally not equipped for this type of situation. What i felt is the staircase is not for human use – it is with broken lights, dirty, claustrophobic, with no air or ventilation, hot and humid. Not to mention the staff and admin people do not care about this problem at all !!! This is not the first time that The Sail @ Marina Bay has been faced with complaints by residents over defects. A bitter feud between CDL and homeowners at The Sail has been ongoing for about four years over a series of alleged defects at the 1,111-unit development. Residents, who have already forked out over a million dollars to rectify some of these defects, have complained about the defective rubbish chute system within the development that forces residents to contend with unpleasant smells, water leaks at lift areas and burst underground water pipes. The condo’s Management Corporation Strata Title (MCST) began legal proceedings and named CDL as the defendants in the lawsuit. While CDL initially denied the claims, it told reporters in January this year that it cannot comment further on the issue since it is an ongoing court matter. The Independent Singapore has written to the management of The Sail @ Marina Bay for their comment on this latest allegation that the all four lifts at Tower 2 broke down today. We will update this story once we receive a response. Meanwhile, units at The Sail @ Marina Bay are presently going for up to $20 million, according to Property Guru. The property portal reports that those interested to rent a unt may face a monthly rental fee of up to $32,208.